A cake for day three of Yoghurt Week. One I've made twice now. The flavour of coconut and orange together is just glorious and the texture of the cake is really fluffy. This cake is a joy to make and a joy to eat. 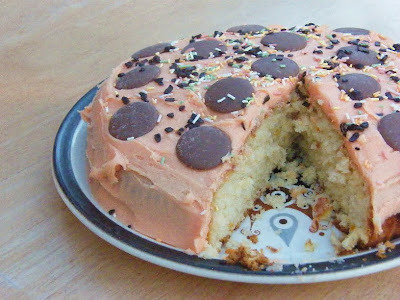 I frosted the cake with orange flavoured icing and topped it with giant buttons and sprinkles. Not my best attempt at icing, but it tasted good. In a bowl mix together the milk, yoghurt, coconut and orange juice. Cover the bowl and leave to stand while you work on the rest of the cake. Preheat the oven to 170f/325c/gas mark 3. 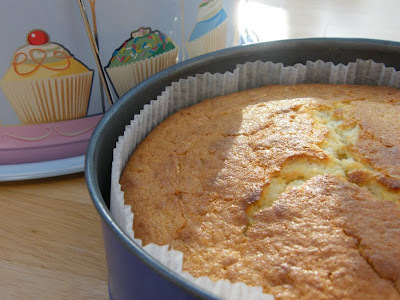 Line your cake tin with greaseproof paper or a liner. My cake tin is a 9 inch/23cm one, but if your tin is slightly different then just keep an eye on the cake as it gets near to the end of baking. In a large bowl beat together the sugar, butter and orange zest until light and creamy then add the eggs one at a time, continuing to beat as you do so. Gradually beat in the flour, baking powder and salt. Adding some of the coconut mixture after each addition of flour until it is all used. Spoon the cake mixture into your pan and bake for 40-50 minutes. Check the cake is ready by inserting a skewer, toothpick or as my mum does, a fine knitting needle. If it comes out clean, then the cake is done. For the frosting mix together the melted butter and icing sugar and add a little orange juice at a time until you have the desired consistency. Add colour at this point, if you wish. 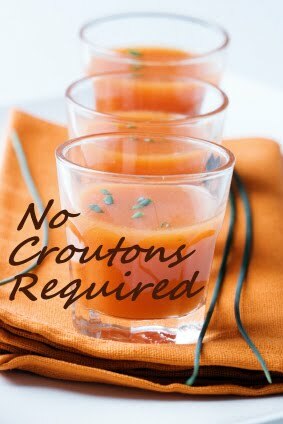 And on to other news, we have a winner for this month's No Croutons Required. This month's challenge was to create a vegetarian soup or salad featuring the humble courgette or zucchini as it is sometimes known and it was a humdinger of a round. All the entries were so varied and mouth-watering. I am sure it was hard for everyone to choose, but one entry took the lead and was triumphant. 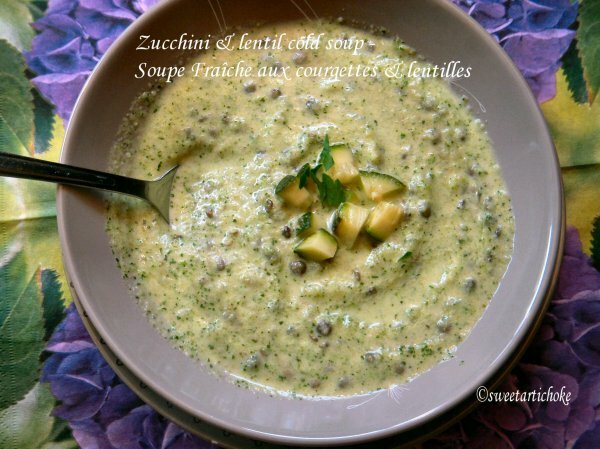 So, without further ado I would like to congratulate Vanessa from Sweet Artichoke, who won with her luscious Zucchini and Lentils Cold Soup. And to tie-in nicely with Yoghurt Week, I would like to point out that the soup contains yoghurt. He, he, it couldn't have worked out better. Who would not appreciate either of those cakes - the red maybe a little startling, but I bet it tasted yummy just the same. Yogurt does wonderful things to cake - I'm really impressed with it. Thanks Choclette. I really wasn't sure about the red, but I had just run out of time and didn't have time to make another batch of frosting. Oh well. I agree with Choclette the red is rather eye-catching!, but I'd still take a piece happily. Also Congraulations to Vanessa on winning this months NCR challenge. OMG! I am so thrilled by the news! Thanks so much! The event was much fun and all the dishes are mouthwatering! Thanks again! The yogurt cakes are delicious and I love your red icing! Very festive! Hey Vanessa, congratulations, it is a fab soup. I have emailed you your winning badge to display on your blog. Love the beautiful color of the cake. I don't cook enough with yogurt, something I need to work on. I'm really enjoy the yogurt posts. Total (the full fat version) is perhaps one of the best yogurts I've ever eaten. I once mistakenly bought the 0% stuff and almost cried - it's just not the same (especially when you're looking for an indulgence!). I actually like the red cake. There are so many ways to use it, I could probably go on for a month TB, but I wouldn't want to over egg the pudding, so to speak. that cake looks wonderful - I love yoghurt in cakes and orange goes so well with it - the icing on your cakes makes me smile - I know how hard it is to get the right amount - the recipe might say as required for the food colouring but in actuality it is often as it comes. Thanks Johanna. Don't you think a dropper in the lid would help? Big congratulations to Vanessa on her well deserved win. Mm I've always wanted to make a yogurt cake! This one looks so nice and soft, and I love that there's coconut in it. The instructions mention eggs but I don't see any eggs in the list of ingredients - how many should be used, please? Excuse my ignorance but what does a cup equate to?